When I was a young Air Force optometrist, I attended a seven-week leadership course at Maxwell Air Force Base in Montgomery, Alabama where I first learned of the World War II Tuskegee Airmen. The large auditorium at Maxwell, where all 700 captains started each day in plenary session, was nicknamed the “blue bedroom” where dozing off was common. One lecture, however, kept everyone awake, charged and listening to every word. A WWII Tuskegee Airman took the stage and for two hours, we listened. We felt the pain of discrimination, the wrongfulness of a segregated military and the glory of being an Army Air Corps pilot. It was difficult for us to understand how these men could fight for a country that did not fight for them. 13 months after that lecture and a one-year detour to Korea, I arrived at Andrews Air Force Base near Washington, D.C., home to hundreds of retired Generals and Admirals. They and their spouses filled my patient schedule daily. On September 14th, 1993, I was graced by the presence of a true American hero. I recognized his name on my patient roster, but it didn’t click until I called him back to my exam room. I repeatedly looked at his name on my roster, then at his face. I finally opened with “Are you THE Benjamin O. Davis?” He smiled and replied, “Why, yes I am.” It was him— Lieutenant General Benjamin O. Davis, Jr, the First Commander of the Tuskegee Airmen. Prior to 1941, there were no African American military pilots. The Tuskegee Program was a Congressional mandate that year forcing the Army Air Corps to form an all-black combat unit. The unit was assigned with flying missions in North Africa and Italy, attacking German positions and escorting B-25 Bombers. By the end of the war, Tuskegee had graduated nearly 1,000 pilots who flew 15,000 sorties, shot down 109 German aircraft, received two Distinguished Flying Crosses and over 700 Air Medals. Their flying records dismantled the misbelief that African Americans could never become accomplished airmen. In fact, Tuskegee Airmen had some of the best pilots in the Army Air Corps. They had done more than helping to win a war— they had broken down a race barrier in the military. In 1948, President Truman signed Executive Order 9981 to integrate the Armed Forces. Tuskegee Airmen were immediately in high demand throughout the Air Force and civilian flight schools. General Davis himself flew in dozens of missions with his men and he received the Silver Star and the Distinguished Flying Cross at war’s end. He continued his Air Force career by serving in high-ranking positions, including Chief of Staff for Twelfth Air Force and Commander of Thirteenth Air Force. He later retired in 1970 at the rank of Lieutenant General (three stars). In 1998, at the age of 85, General Davis received his fourth star from President Clinton at a special White House Ceremony. 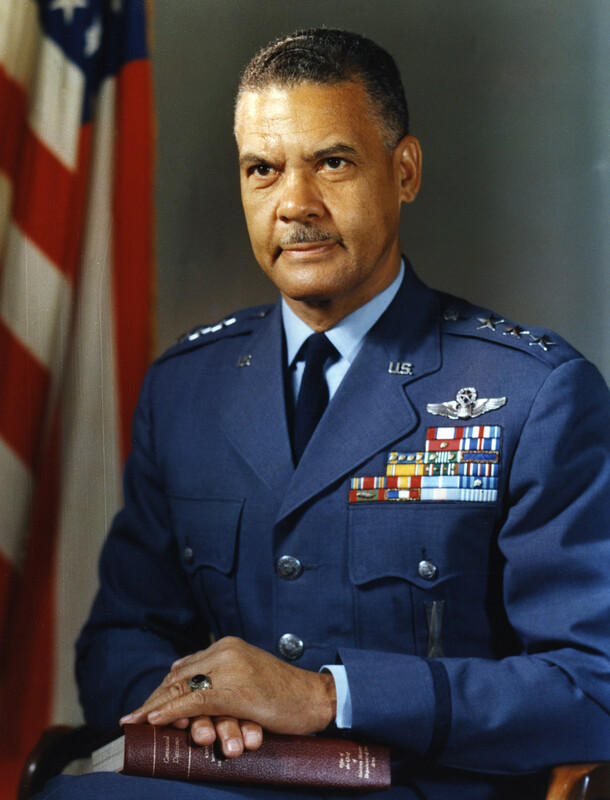 General Davis passed away on July 4th, 2002 and is buried in Arlington National Cemetery. From being the only black cadet in his class at West Point, where he ate by himself in those lonely days, to commanding thousands of airmen of all races, General Davis never let discrimination hold him back. His dedication to his country opened doors for those who followed. General Davis and his wife, Agatha, were my patients annually during the three years I was stationed at Andrews. He autographed my patient roster, and it remains my most treasured military keepsake. I count myself fortunate to have met General Benjamin O. Davis.